For our purposes we're going to create different lead types for our different categories leads. Here's a complete write up on creating and managing lead types. 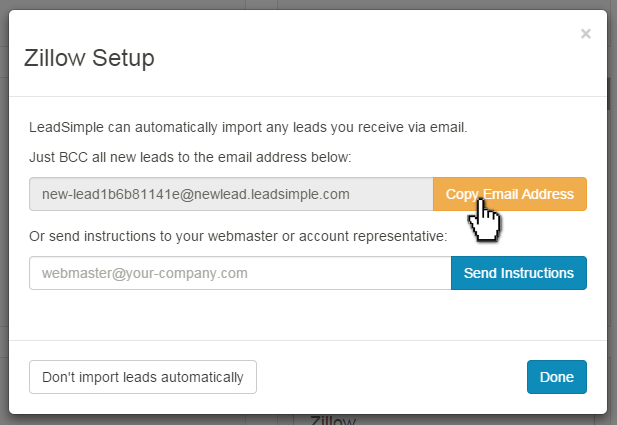 Read about the basics of importing leads. Go to the 'Notifications & Routing' page under settings and select who you want notified when new leads come in for this product or service. Each lead type has it's own set of lead sources. Send the lead source email to your lead provider to start sending leads to. To find this email, click on the lead source and click the button that says "Automatically import email leads". Click the 'Copy Email Address' button and provide that to your webmaster or lead provider so that leads can begin to be sent to this email and thus imported into LeadSimple. Note that you can email instructions directly to the lead provider by entering their email address in the second field and clicking send instructions. Your lead provider may only allow you to send leads to one email address, in which case you should ideally keep your personal email on file with the lead provider and instead set up a forwarding rule to forward leads into LeadSimple. You can read more about setting up forwarding rules here.